If you don't already know through my Instagram or through the prior I ❤ NY posts, I really love sushi. I'm constantly on the hunt for quality sushi restaurants here in the city! After mentioning to a friend that I love Sushi Yasuda (reviewed here), she recommended that I try out Sushi Yasaka, a small quaint sushi restaurant on the Upper West Side. 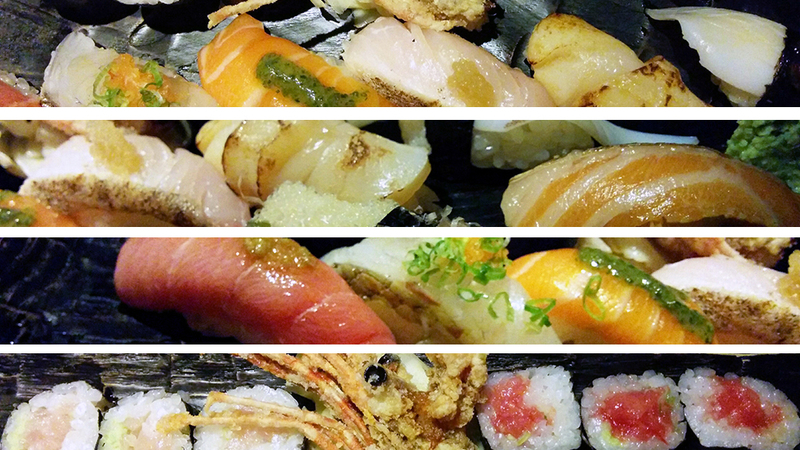 It's not a high-end dining experience like Sushi Yasuda, but the price point for the quality that you get is unbeatable! 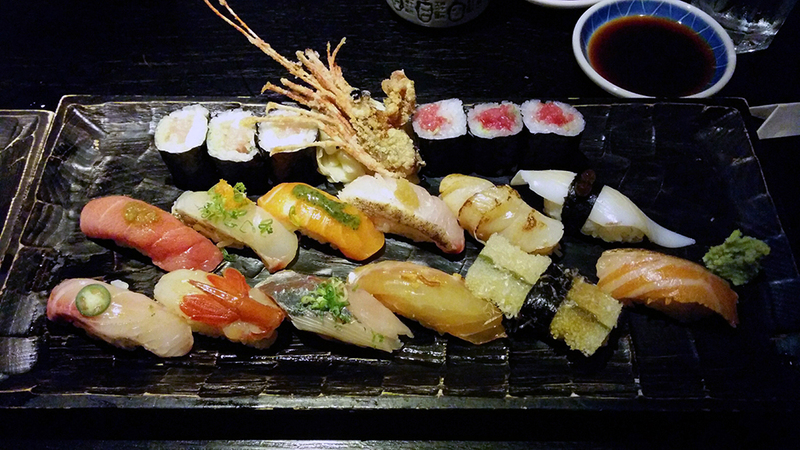 Sushi Yasaka's omakase meal costs $45 for 12 pieces of sushi and one whole maki roll. This is similar in price to Sushi Yasuda's Sushi Matsu meal which is also 12 pieces of sushi but they only give you a maki trio (3 pieces), and not a full maki roll (6 pieces). Also, traditionally omakase is supposed to be served piece by piece, but at Sushi Yasaka they serve it to you all at once. If you don't like a particular type of fish, you can tell your waiter or waitress and the restaurant will happily substitute that item for you without any extra charge. We got the following items in our omakase meal, and I think it stays pretty consistent throughout the year; hamachi scallion maki trio, marinated tuna maki trio, toro (fatty tuna), Japanese snapper, King salmon (my favorite type of salmon), bonito, scallop, squid, baby hamachi (yellowtail), shrimp, mackerel, soy-garlic snapper, herring eggs, and instead of uni (I'm not really a big fan) I got seared salmon. For $45, the quality can't be beat! As you can tell from the garnishes on top of the sushi, this isn't traditional Japanese sushi where the focus is just on the fish's natural flavor. If you like this type of sushi, I also recommend Sushi of Gari which another quality sushi restaurant that also garnishes its fish. The winners of the omakase meal are the toro, marinated tuna maki trio, and the soy-garlic snapper. The toro literally melted in my mouth as I chewed and was full of flavor. The same applied to the marinated tuna maki trio. The unsuspecting pleasant surprise was the soy garlic snapper. Usually I'm not a fan of snapper at all, but this piece was full of flavor and didn't have that strong fishy taste snappers usually have. 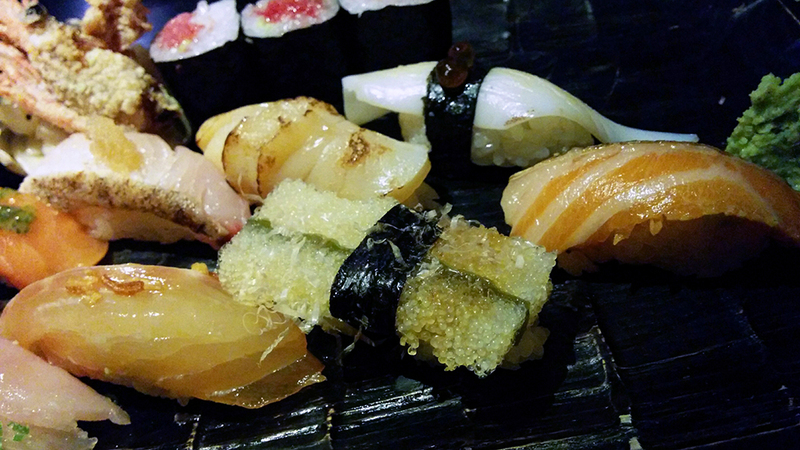 The pieces I didn't enjoy so much were the Japanese snapper, squid, and herring eggs. The Japanese snapper was garnished with ginger which I'm not a fan of personally. I also didn't like the texture of the squid - it was chewy but crunchy simultaneously. The best way to describe the herring eggs was that it was a dry rice-crispy but it was made up of eggs and not rice. It's an unappetizing as it sounds. From top left to right: toro, Japanese snapper, king salmon, bonito, baby hamachi with jalapeno garnish, shrimp, and mackerel with scallions. From top left to right: Bonito, scallop, squid with salmon roe garnish, soy-garlic snapper, herring eggs, and seared salmon. 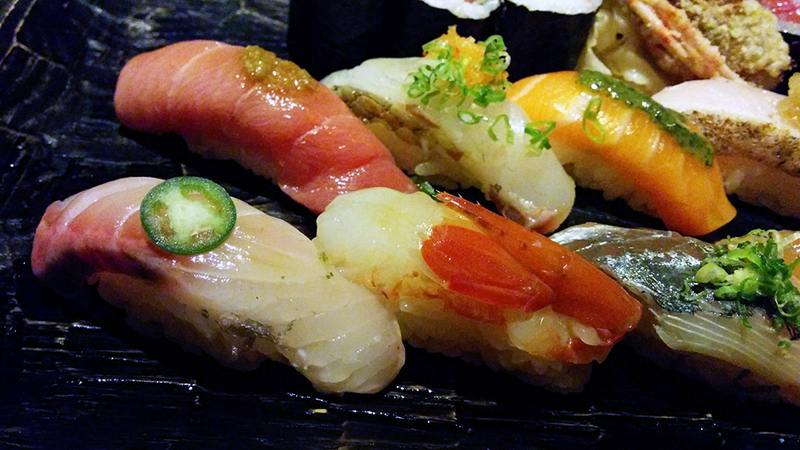 On left - hamachi maki trio with scallions; Fried (edible) prawn head; On right - marinated tuna maki trio. I couldn't resist getting a spicy tuna roll on the side! Sushi Yasaka's spicy tuna is absolutely delicious. It tastes very fresh unlike a lot of other spicy tuna rolls I've had. The texture of the roll is soft and chewy and as you can see they are very generous with the fish. I also dislike dry rolls where the restaurant puts way too much "tempura crunch" in the roll. 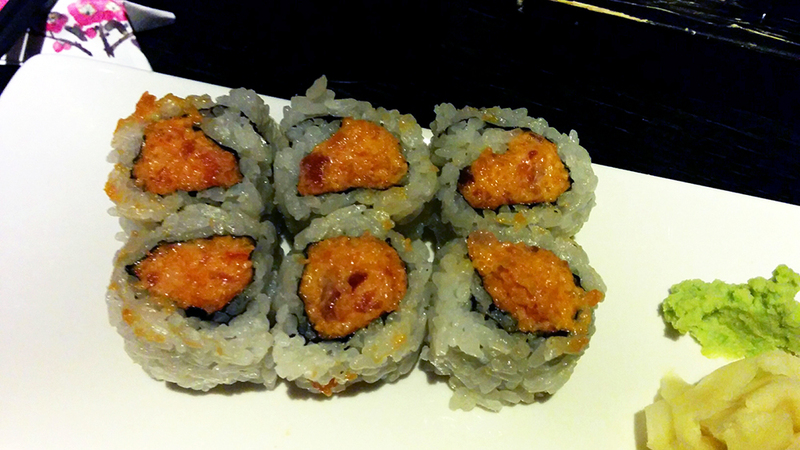 Sushi Yasaka's spicy tuna roll is devoid of crunch particles and not dry at all. The last high point of Sushi Yasaka is the desserts!! 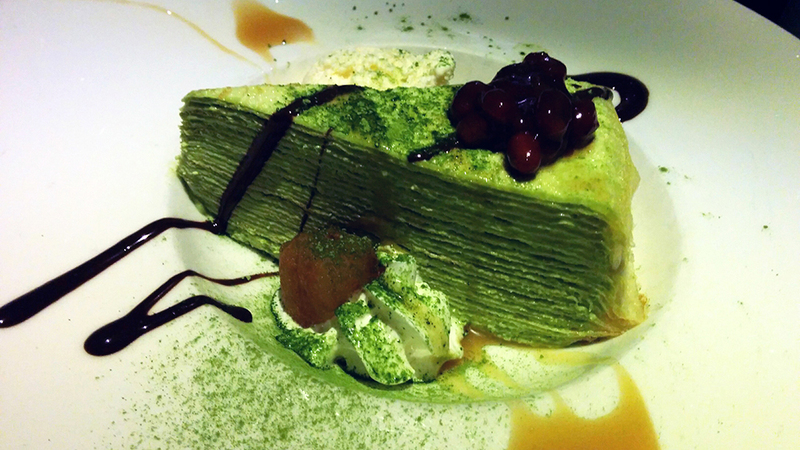 I've had the green tea mille crepe before at other restaurants and I really like it. Basically the cake is made up of layers and layers of thin crepes held together with creme. Sushi Yasaka has both vanilla and green tea flavored mille crepes on offer. They also have the standard mochi ice cream as well. In conclusion, I absolutely adore Sushi Yasaka. The price is just so affordable for the quality of fish that you get. Sushi Yasaka has an official site if you're interested in more information. I recommend that you make reservations, especially for Friday and Saturday since the place gets packed and people are waiting for tables. They are very good with seating you on time as well. You can make reservations online via their Yelp page.